Thanks to the generosity of our donors, we received 679 gifts, totaling $63,606, to help “light the way for people with dementia” during our Holiday Campaign. That total includes the $15,000 given by Neil Carlson, Sean Lawton and Elden Wittmier to help support programs and services offered by the Alzheimer Society of Manitoba. 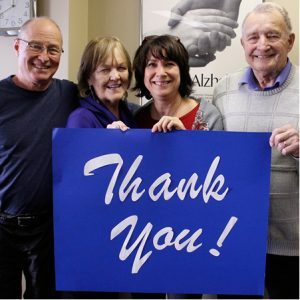 We are immeasurably grateful for everyone’s support and commitment to the many Manitobans impacted by dementia and to the work we do to support them. We could not do this work without you. Click here to make a gift today and light the way in someone’s life who is impacted by dementia.